Mattresses are typically sold with a box spring, which are specially designed to add firmness to the mattress. In some cases, individuals may find the support inadequate for their needs and may consider adding plywood, which is made of several layers of glued-together wood, to provide more firmness to a bed. Adding a sheet of plywood to an old, worn mattress is also an alternative to buying a new mattress set. Plywood typically costs much less than buying a new bed. The thickness requirements for plywood vary depending on the type of mattress. Plywood thinner than 3/4 inch should not be used, as it will not be strong enough to hold the weight of a bed mattress and a person lying down. The plywood can be exactly 3/4 inch thick, but ideally, it should be thicker. The weight of the mattress and stature of the user should be considered when deciding on the thickness of the plywood. 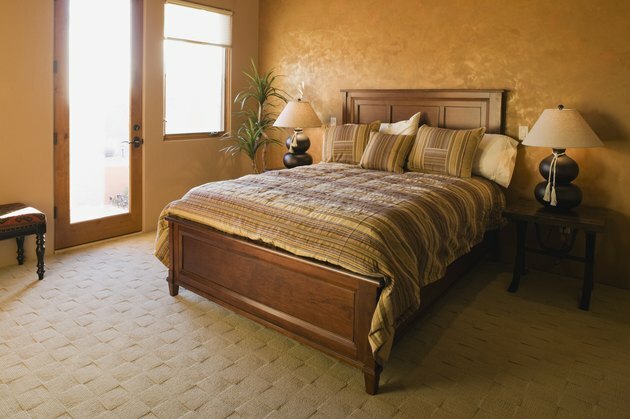 Plywood is a cost-efficient and easy way to add firmness to a worn-out mattress. The biggest advantage is that it prolongs the life of the mattress, helping to avoid the need to spend money on a new mattress set. Plywood is easy to install and requires little to no assistance; just some wood measurements are required. In most cases, plywood will not allow the mattress to breathe properly, causing it to hold in moisture and even mold. While it's true that plywood is an easy fix to a soft bed mattress problem, it will cause the mattress to wear down faster, as the wood splinters will snag and unravel the mattress fabric. Plywood may also not provide the adequate and proper support that a new mattress offers. Before laying a piece of plywood under your mattress, read your mattress warranty, as using plywood might void it. The warranty card should have specific guidelines and warranty details. For the most part, warranties are straightforward and specify that altering the original design of the bed will result in the factory warranty being void. Does Plywood Under the Mattress Work for a Sagging Mattress?